Yahoo! recently released a new Firefox extension called YSlow. This article describes how to get started and what we did at Playing With Wire to get our front page to load in almost half the time. YSlow is a handy little tool for analyzing the performance of your websites. It will give you vital statistics and grade your site on 13 performance points with helpful hints for what you may be able to do to improve the loading speed of your pages. YSlow is actually a plugin to a plugin in Firefox. 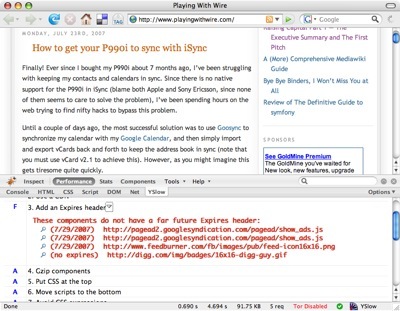 To use it, you need Firefox and the Firebug web developer plugin. Both are easily installable using links from YSlow’s homepage however. Once you’ve restarted Firefox with the new plugins installed, all you have to do is to activate Firebug for a particular site and you’re ready to go. Normally, this means surfing to the site and then revealing Firebug from its icon in the Firefox status bar. Just click the Firebug icon and it will reveal it’s main view. In it, it will most likely say that Firebug is disabled. 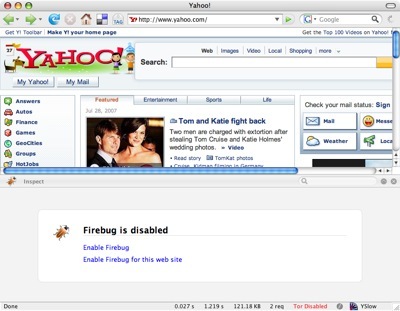 Just click ‘Enable Firebug for this web site’ and you’re ready to start dissecting it’s performance with Yahoo!’s YSlow. Once you have Firebug enabled, switch to the ‘Performance’ tab and you’ll get a grade on your website’s loading performance. The grade breaks down into several subcomponents where each one corresponds to a point in Yahoo!’s Thirteen Simple Rules for Speeding Up Your Web site. The grading is fairly arbitrary and should be taken with a grain of salt. For example, if you have 35 downloads for your page and just four of them don’t have an Expires header, YSlow will give you a harsh F in that category. Hello, is this Google? YSlow is giving me an F in Expires headers. Could you reconfigure your ad servers for me? None the less, the sub-points of the grade-sheet are great hints for what you can do with your site. While you’ll probably be forced to ignore the ‘grades’ if you have externally sourced ad units like we do, you can still work your way through the list and fix everything that you do have control over. This is what we did with Playing With Wire and astonishingly enough we reduced the download size to about half of what it used to be. Below are the best tricks we learnt or revisited after using YSlow. How to set up compression depends on your application and web server software. If you’re using Apache, you can have the server do it for you for normal files. For dynamic content such as that generated by PHP it depends. In WordPress there’s a switch in the Options tab. If you’re using wp-cache like Playing With Wire is, it may take some more work to get things up and running, but it’s well worth the effort. Thanks for the tips. I’ve already applied them to my blog with nice results. And although my traffic doesn’t justify the effort, I’m glad I’ve learned a few useful Apache directives in the process :)!